In order to harness the transformative potential of the Fourth Industrial Revolution, business leaders across all industries and regions will increasingly be called upon to formulate a comprehensive workforce strategy ready to meet the challenges of this new era of accelerating change and innovation. Policy-makers, educators, labour unions and individual workers likewise have much to gain from deeper understanding of the new labour market and proactive preparation for the changes underway. Key factors to consider include mapping the scale of occupational change underway and documenting emerging and declining job types; highlighting opportunities to use new technologies to augment human work and upgrade job quality; tracking the evolution of job-relevant skills; and, finally, documenting the business case for investment in retraining, upskilling and workforce transformation. The following three sub-sections of the report aim to provide informative data and evidence to support such an endeavour. As discussed in the report’s Introduction, recent projections of the extent of structural change in the global labour market depend significantly on the time horizon taken into consideration.7 In addition to the rate of technological advancement itself, a range of other considerations—such as ease of commercialization, public adoption of new technologies8 and existing labour laws—influence the rate at which these developments accelerate workforce transformation. In the estimates of employers surveyed for this report, global labour markets are set to undergo significant transformation over the coming five years. A cluster of emerging roles will gain significantly in importance over the coming years, while another cluster of job profiles are set to become increasingly redundant (Figure 3). Across all industries, by 2022, the cluster of emerging professions is set to increase its share of employment from 16% to 27% of the total employee base of our company respondents, whereas the employment share of declining roles is set to decrease from currently 31% to 21% (Figure 3). In purely quantitative terms, therefore, the expectation emerging from the estimates of employers surveyed for this report is that, by 2022, structural decline of certain types of jobs (10% decline) will be fully counter-balanced by job creation and the emergence of new professions (11% growth).About half of today’s core jobs—making up the bulk of employment across industries—will remain somewhat stable in the period up to 2022. It should be noted, however, that these projections primarily represent the share of roles within the remit of large multinational employers. A complementary perspective might emerge from analysis that focuses on small- and medium-sized enterprises, or more fully takes into account employment sectors such as health, care and education. In particular such segments of economic activity hold the promise for further job creation opportunities. As they stand today responses to the Future of Jobs Survey indicate the potential for a positive outlook for the future of jobs. Yet that outlook is underscored by the need to manage a series of workforce shifts, set to accompany the adoption of new technologies. By 2022, 59% of employers surveyed for this report expect that they will have significantly modified the composition of their value chain, and nearly half expect to have modified their geographical base of operations. In addition, 50% of companies expect that automation will lead to some reduction in their full-time workforce, based on the job profiles of their employee base today. Also by 2022, 38% of businesses surveyed expect to extend their workforce to new productivity-enhancing roles, and more than a quarter expect automation to lead to the creation of new roles in their enterprise. In addition, businesses are set to expand their use of contractors doing task-specialized work, with many respondents highlighting their intention to engage workers in a more flexible manner, utilizing remote staffing beyond physical offices and decentralization of operations. Respondents expect increased job creation in such project-based, temporary and freelancing roles, pointing to structural labour market transformations in terms of contractual arrangements and employment relations as well as occupational profiles. In summary, while overall job losses are predicted to be offset by job gains, there will be a significant shift in the quality, location, format and permanency of new roles. Among the range of roles that are set to experience increasing demand in the period up to 2022 are established roles such as Data Analysts and Scientists, Software and Applications Developers, and Ecommerce and Social Media Specialists that are significantly based on and enhanced by the use of technology. Also expected to grow are roles that leverage distinctively ‘human’ skills such as Customer Service Workers, Sales and Marketing Professionals, Training and Development, People and Culture, and Organizational Development Specialists as well as Innovation Managers. Moreover, our analysis finds extensive evidence of accelerating demand for a variety of wholly new specialist roles related to understanding and leveraging the latest emerging technologies: AI and Machine Learning Specialists, Big Data Specialists, Process Automation Experts, Information Security Analysts, User Experience and Human-Machine Interaction Designers, Robotics Engineers and Blockchain Specialists (Table 3). Across the industries surveyed, jobs expected to become increasingly redundant over the 2018–2022 period are routine-based, middle-skilled white-collar roles—such as Data Entry Clerks, Accounting and Payroll Clerks, Secretaries, Auditors, Bank Tellers and Cashiers (Table 3)—that are susceptible to advances in new technologies and process automation. These shifts reflect unfolding and accelerating trends that have evolved over a number of recent years—continuing developments that have impacted roles in retail banking (ATMs), consumer sales (self-checkout kiosks) and other sectors.10 Given that the skills requirements of emerging roles frequently look very different from those of roles experiencing redundancy, proactive, strategic and targeted efforts will be needed to map and incentivize workforce redeployment. Note: Roles marked with * appear across multiple columns. This reflects the fact that they might be seeing stable or declining demand across one industry but be in demand in another. Industries are set to take diverse routes in the adoption of new technologies, and the distinctive nature of the work performed within each sector will result in disruption to jobs and skills that will demand industry-specific adaptation. For example, given comparatively high levels of education in the financial services industry, displaced roles may be somewhat more easily offset by redeploying workers in alternative, higher value-added functions. In contrast, the two largest job roles in the consumer industry, Cashiers and Sales Associates—accounting for no less than 45% of total industry employment—have a comparatively small share of workers with advanced education.11 Cross-industry analysis of the roles experiencing falling and rising demand suggests the possibility of leveraging those industry-specific differences for the benefit of displaced workers, by expanding the search for new opportunities across the industry landscape. While the labour market shifts described in this section are not foregone conclusions, they are reasonable forecasts emerging from the actions and investment decisions taken by companies in response to global trends today. As new technology adoption builds momentum, companies feel competitive pressures similar to the way they felt compelled to create global supply chains in the 1990s and 2000s.12 These trends affecting business leaders’ decision environments are prompting a wide range of company responses that collectively shape the future nature of jobs (Figure 4). While individual companies may not have the option to disconnect their corporate strategy from the fundamental trajectory of these wider trends, such as the unfolding Fourth Industrial Revolution, they do, however, have the possibility of formulating a proactive response. Two investment decisions, in particular, will be crucial to shaping the future of jobs: the question of whether to prioritize automation or augmentation and the question of whether or not to invest in workforce reskilling. These two crucial dimensions are examined further in the following two sub-sections. Importantly, most automation occurs at the level of specific work tasks, not at the level of whole jobs.15 For example, according to one recent study, whereas nearly two-thirds of today’s job roles entail at least 30% of tasks that could be automated based on currently available technology, only about one-quarter of today’s job roles can be said to have more than 70% of tasks that are automatable.16 A similar recent analysis finds that workforce automation is likely to play out in three waves between today and the mid-2030s, increasing the share of fully automatable manual tasks in the most affected current job roles from less than 5% today to nearly 40% by the mid-2030s, and the share of automatable tasks involving social skills from less than 5% today to about 15% in the same time horizon.17 The most relevant question to businesses, governments and individuals is not to what extent automation will affect current employment numbers, but how and under what conditions the global labour market can be supported in reaching a new equilibrium in the division of labour between human workers, robots and algorithms. Workforce planning and investment decisions taken today will play a crucial role in shaping this process. The estimates of companies surveyed for this report provide a nuanced view of how human-machine collaboration might evolve in the time horizon up to 2022 (Figure 5). In today’s enterprise, machines and algorithms most often complement human skills in information and data processing. They also support the performance of complex and technical tasks, as well as supplementing more physical and manual work activities. However, some work tasks have thus far remained overwhelmingly human: Communicating and interacting; Coordinating, developing, managing and advising; as well as Reasoning and decision-making. Notably, in terms of total working hours, in the aggregate no work task was yet estimated to be predominantly performed by a machine or an algorithm. By 2022, this picture is projected to change somewhat. 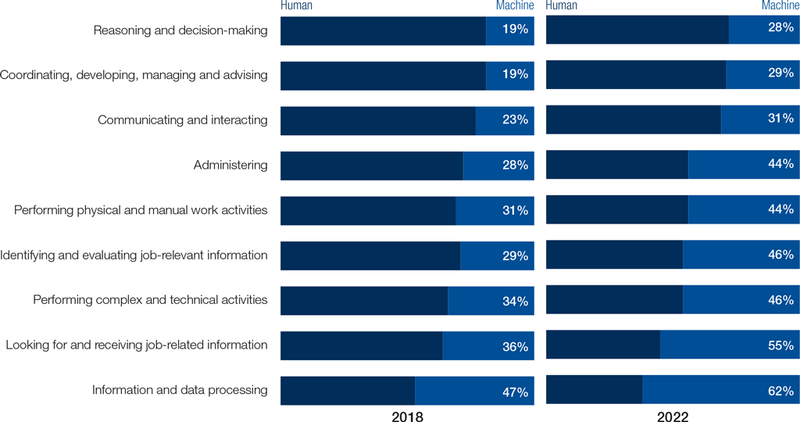 Employers surveyed for this report expect a deepening across the board of these existing trends, with machines and algorithms on average increasing their contribution to specific tasks by 57%. Relative to their starting point today, the expansion of machines’ share of work task performance is particularly marked in Reasoning and decision-making; Administering; and Looking for and receiving job-related information. The majority of an organization’s information and data processing and information search and transmission tasks will be performed by automation technology (Figure 5). For workers, improved productivity may allow them to re-focus their work on high-value activities that play to the distinctive strengths of being human. However, to unlock this positive vision, workers will need to have the appropriate skills that will enable them to thrive in the workplace of the future. And as discussed in detail in the next section, even for those who currently have these skills, the pace at which tasks are being augmented and skills are changing continues to accelerate. Key skills demand trends identified by our analysis include, on the one hand, a continued fall in demand for manual skills and physical abilities and, on the other hand, a decrease in demand for skills related to the management of financial and other resources as well as basic technology installation and maintenance skills (Table 4). Skills continuing to grow in prominence by 2022 include Analytical thinking and innovation as well as Active learning and learning strategies. The sharply increased importance of skills such as Technology design and programming highlights the growing demand for various forms of technology competency identified by employers surveyed for this report. Proficiency in new technologies is only one part of the 2022 skills equation, however, as ‘human’ skills such as creativity, originality and initiative, critical thinking, persuasion, and negotiation will likewise retain or increase their value, as will attention to detail, resilience, flexibility and complex problem-solving. Emotional intelligence, leadership and social influence as well as service orientation also see an outsized increase in demand relative to their current prominence. Companies will need to pursue a range of organizational strategies in order to stay competitive in the face of rapidly changing workforce skills requirements. To do this, the skills of executive leadership and the human resources function will also need to evolve to successfully lead the transformation. With regard to likely approaches towards workers facing shifting skills demand, companies surveyed for this report specifically highlight three future strategies: hiring wholly new permanent staff already possessing skills relevant to new technologies; seeking to completely automate the work tasks concerned; and retraining existing employees (Figure 6). The likelihood of hiring new permanent staff with relevant skills is nearly twice the likelihood of strategic redundancies of staff lagging behind in new skills adoption. However nearly one-quarter of companies are undecided or unlikely to pursue the retraining of existing employees. Two-thirds expect workers to adapt and pick up skills in the course of their changing jobs. Between one-half and two-thirds are likely to turn to external contractors, temporary staff and freelancers to address their skills gaps. Note: The bars represent the proportion of responses by companies that stated that specific strategies were likely, equally likely or unlikely. Some companies abstained from answering the question. In such cases part of the bar remains blank (typically, 0–1% in the graph above). Employers surveyed for this report estimate that, by 2022, no less than 54% of all employees will require significant reskilling and upskilling (Figure 7). 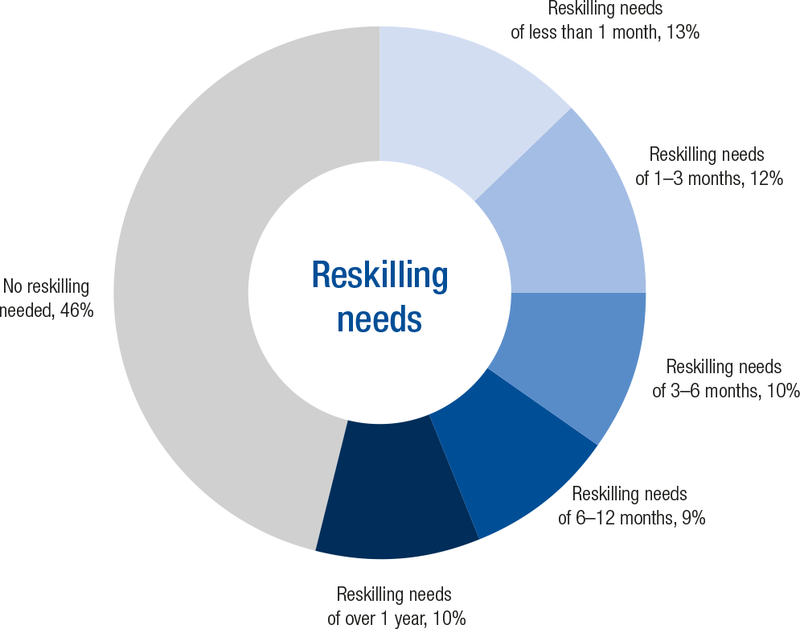 Of these, about 35% are expected to require additional training of up to six months, 9% will require reskilling lasting six to 12 months, while 10% will require additional skills training of more than a year. Respondents to our survey further indicate that they are set to prioritize and focus their reskilling and upskilling efforts on employees currently performing high value roles as a way of strengthening their enterprise’s strategic capacity, with 54% and 53% of companies, respectively, stating they intend to target employees in key roles and in frontline roles which will be using relevant new technologies. In addition, 41% of employers are set to focus their reskilling provision on high-performing employees while a much smaller proportion of 33% stated that they would prioritize at-risk employees in roles expected to be most affected by technological disruption. In other words, those most in need of reskilling and upskilling are least likely to receive such training. These findings are a cause for concern, given that making an inclusive culture of lifelong learning a reality is increasingly imperative for organizations and for workers whose growth strategies and job roles are being affected by technological change. In particular, they highlight that the bottom-line impact and business case for reskilling and upskilling investments remain somewhat unclear and require much greater attention. Time requirements, costs, success cases and appropriate delivery models for reskilling and upskilling are likely to look very different for different categories of job roles and workers. To provide a preliminary picture, companies surveyed for this report highlight that, overwhelmingly, their key success metric for reskilling and upskilling initiatives is increased workforce productivity—chosen by 90% of respondent employers—followed by retention of high-skilled workers, enabling workers in frontline roles to make the best use of new technologies and increased employee satisfaction. Significantly smaller proportions of companies regard reskilling as a means of lowering recruitment costs, redeploying employees in disrupted job roles or as a way to increase the skills base of their medium- and lower-skilled workforce. In short, to date reskilling has been regarded by employers as a narrow strategy focused on specific subsets of employees, not as a comprehensive strategy to drive workforce transformation. Finally, while companies themselves will need to take the lead in creating capacity within their organizations to support their transition towards the workforce of the future, the economic and societal nature of these challenges means that they will also increasingly need to learn to partner with other stakeholders for managing the large-scale retraining and upskilling challenges ahead. Tangible collaboration opportunities include partnering with educators to reshape school and college curricula, intra- and inter-industry collaboration on building talent pipelines, and partnerships with labour unions to enhance cross-industry talent mobility. Governments may likewise become key partners in creating incentives for lifelong learning, ensuring shared standards for retraining and strengthening safeguards for workers in transition.35 However, more guidance and good practice learning opportunities will be needed. Currently, respondents to our survey expect to continue to primarily look to specialized internal departments to meet their retraining needs for the period up to 2022, with some supplementary support from professional services firms, industry associations and academic experts (Figure 8). Less than half of companies actively consider partnering with government programmes and slightly more than a fifth see labour unions as preferred partners. Companies surveyed for this report anticipate that, over the 2018–2022 period, on average, around half of all retraining will be delivered through internal departments, about one quarter through private training providers and about one-fifth through public education institutions. About 34% of the retraining to be delivered directly by employers is expected to result in an accreditation recognized outside of the company in question. Expanding such systems for certifiable skills recognition could significantly promote the marketplace for corporate reskilling and upskilling in the near future and improve outcomes for workers. These findings highlight both the future role of companies as learning organizations and the range of possible reskilling and upskilling multistakeholder collaboration arrangements. 7 See, for example, the differing perspectives provided by: Bain & Company, Labor 2030: The Collision of Demographics, Automation and Inequality; McKinsey & Company, Jobs lost, jobs gained: Workforce Transitions in a Time of Automation, McKinsey Global Institute (MGI), 2017; and PwC, Will robots really steal our jobs? An international analysis of the potential long-term impact of automation, 2018. 8 As noted by a recent Bain & Company study, while public reaction to new technologies is likely to vary substantially from one country to the next, thereby accelerating or decelerating their adoption, differences in public policies toward new technologies such as automation may be harder to sustain if their applications are tradeable. For example, if London were to deregulate the application of fully autonomous machine learning algorithms in financial markets, competitive forces are likely to put greater pressure on technology regulators in New York to follow suit. By contrast, if London were to permit coffee shops more generous labour automation leeway than New York, differences are more likely to remain localized; see: Bain & Company, Labor 2030: The Collision of Demographics, Automation and Inequality. 9 These extrapolated figures are based on employers’ current projections for the set of roles with increasing, declining and stable demand in the period up to 2022, which were estimated by employers as a share of each enterprise’s total workforce. The figures were then applied to the International Labour Organization’s estimates and projections of global non-agricultural employment in both 2018 and 2022, adjusted for the estimated share of total employment represented by this report’s respondent data, i.e. large businesses. The figures used for estimating the global share of large business employment are based on established estimates by the World Bank, US Bureau of Labor Statistics and Eurostat, holding the distribution of firm size constant between 2018 and 2022. 10 Barclays, Robots at the gate: Humans and technology at work, 2018. 12 Bain & Company, Labor 2030: The Collision of Demographics, Automation and Inequality. 13 See: Ton, Zeynep and Sarah Kalloch, Transforming Today’s Bad Jobs into Tomorrow’s Good Jobs, Harvard Business Review, June 2017; Deloitte, Reconstructing Jobs: Creating good jobs in the age of artificial intelligence, 2018. 14 Davenport, Thomas and Julia Kirby, Beyond Automation, Harvard Business Review, June 2015. 15 See for example: Arntz, Melanie, Terry Gregory and Ulrich Zierahn, The risk of automation for jobs in OECD countries: a comparative analysis, OECD Social, Employment and Migration Working Papers No 189, Organisation for Economic Cooperation and Development (OECD), 2016; McKinsey Global Institute, A Future That Works: Automation, Employment, and Productivity, McKinsey Global Institute (MGI), 2017; PwC, Will robots really steal our jobs? An international analysis of the potential long term impact of automation. For a range of relevant additional considerations, see: van der Zande, Jochem, et al., The Substitution of Labor: From technological feasibility to other factors influencing job automation, Innovative Internet: Report 5, Stockholm School of Economics Institute for Research, 2018. 16 McKinsey Global Institute, A Future That Works: Automation, Employment, and Productivity. 17 PwC, Will robots really steal our jobs? An international analysis of the potential long term impact of automation; the three waves of workforce automation identified by the report consist of an algorithmic wave(to early 2020s; involving ‘automation of simple computational tasks and analysis of structured data, affecting data-driven sectors such as financial services’); an augmentation wave(to late 2020s; involving ‘dynamic interaction with technology for clerical support and decision making … including robotic tasks in semi-controlled environments such as moving objects in warehouses); and an autonomous wave(to mid-2030s; involving ‘automation of physical labour and manual dexterity, and problem-solving in dynamic real-world situations that require responsive actions, such as in transport and construction’). 18 A thought-provoking empirical perspective on this process is provided by: Cohen, Lisa, “Assembling Jobs: A Model of How Tasks Are Bundled Into and Across Jobs”, Organization Science, vol. 24, no. 2, 2012. 19 Autor, David, “Why Are There Still So Many Jobs? The History and Future of Workplace Automation”, Journal of Economic Perspectives, vol. 29, no. 3, 2015, pp. 3–30. 20 For example, since its launch in 2008, developers have earned more than US$86 billion through Apple’s App Store platform, and app development is estimated to have created more than 1.7 million jobs in the United States and more than 2 million jobs in Europe; see: Apple, App Store kicks off 2018 with record-breaking holiday season, https://www.apple.com/newsroom/2018/01/app-store-kicks-off-2018-with-record-breaking-holiday-season, 2018; Mandel, M., U.S. App Economy Jobs Update, Progressive Policy Institute, http://www.progressivepolicy.org/blog/u-s-app-economy-update, 2017; and Mandel, M., Update on European App Economy jobs, Progressive Policy Institute, http://www.progressivepolicy.org/blog/update-on-european-app-economy-jobs, 2018. 21 Dellot, Benedict, “Why automation is more than just a job killer”, RSA Blog, 20 July 2018, https://www.thersa.org/discover/publications-and-articles/rsa-blogs/2018/07/the-four-types-of-automation-substitution-augmentation-generation-and-transference. The RSA, a British think tank, accordingly distinguishes four types of automation: (1) substitution(‘technology taking on a task that would [otherwise have been] be undertaken by a worker’; (2) augmentation(‘[technology] expand[ing] the capability of workers, allowing them to achieve more and better-quality work in a shorter space of time’); (3) generation(‘[technology] generat[ing] tasks that were never done by humans previously … creat[ing] work rather than captur[ing] it from others’); (4) transference (‘technology shift[ing] responsibility for undertaking a task from workers to consumers. Self-service checkouts, for instance, have not done away with the job of processing items through tills. Instead they’ve merely passed on the responsibility to shoppers. … This form of automation typically relies on … sophisticated UX and UI Design’); ibid. 22 An innovative effort to distinguish between labour-substituting and labour-augmenting technologies—based on 78 individual tools and technologies—is provided by: Nedelkoska, Ljubica and Glenda Quintini,Automation, skills use and training, OECD Social, Employment and Migration Working Papers, No. 202, OECD, http://dx.doi.org/10.1787/2e2f4eea-en, 2018. 23 KPMG, The augmented workforce; Cognizant, The Robot and I: How New Digital Technologies Are Making Smart People and Businesses Smarter by Automating Rote Work, 2015. 24 Dellot, Why automation is more than just a job killer. 25 Measured in incremental additional US$ of gross output per worker, i.e. excluding baseline forecasts of labour productivity growth; Bain & Company, Labor 2030: The Collision of Demographics, Automation and Inequality. 26 Jesuthasan, Ravin and John Boudreau, Thinking Through How Automation Will Affect Your Workforce, Harvard Business Review, April 2017; also see: Jesuthasan, Ravin, “You may not be a disrupter, but you might find opportunities in the gig economy”, Willis Towers Watson Blog, 24 July 2017, https://www.willistowerswatson.com/en/insights/2017/07/insights-gig-economy. 27 Shook, Ellyn and Mark Knickrehm, Harnessing Revolution: Creating the Future Workforce, Accenture Strategy, 2017. 28 Autor, David, Frank Levy and Richard Murnane, Upstairs, Downstairs: Computer-Skill Complementarity and Computer-Labor Substitution on Two Floors of a Large Bank, NBER Working Paper No. 7890, National Bureau of Economic Research, 2000. 29 Barclays, Robots at the gate: Humans and technology at work. 30 Shook and Knickrehm, Harnessing Revolution: Creating the Future Workforce. 31 For a detailed analysis, see the sections The Future of Jobs across Industries and The Future of Jobs across Regions; also see: McKinsey & Company, Skill Shift: Automation and the Future of the Workforce, Discussion Paper, McKinsey Global Institute (MGI), 2018. 32 For a more extensive discussion of the concept of skills stability, see: World Economic Forum, The Future of Jobs: Employment, Skills and Workforce Strategy for the Fourth Industrial Revolution, 2016 and CEDEFOP, Briefing Note: Preventing skill obsolescence, 2012. 33 Nedelkoska and Quintini, Automation, skills use and training. 34 McKinsey & Company, Skill Shift: Automation and the Future of the Workforce.